Belfast News Mystery Who Bought Ormiston House? Belfast News Mystery: Who Bought Ormiston House? Despite public concerns that the Northern Ireland Executive is selling off the family silver, Ormiston House in East Belfast has been sold off. As users are aware Simply Belfast have stories and photo albums showing the beauty of this historic and maritime significant property. Given that the Northern Ireland property market is again on the rise it was not hard to see that a property that was originally purchased for nearly �10 million would eventually sell but who would have imagined this would have been for less than �2 million. Even members on the Assembly Commission, the corporate body of the Northern Ireland Assembly that approved the sale, had to declare interests, one, an Alliance member noted that she was familiar with several family members related to a potential purchaser and another DUP member declared an interest in that he was aware that a Party colleague was a Director in a company which had put forward a bid. In the end, according to the Northern Ireland Assembly neither bidder was successful, so who did purchase this hugely significant building? The Northern Ireland Assembly refused to say indicating the purchaser wished to remain anonymous. However, can it be right that the public who have lost nearly �10 million, that's �10,000,000.00 in this sale be denied not only access to this property and the right to view it's marvellous interior or stroll in its grounds but also denied to know who purchased it at such a mark down price. Should there not be transparency, well given that our request of the Northern Ireland Assembly was denied it would appear not? 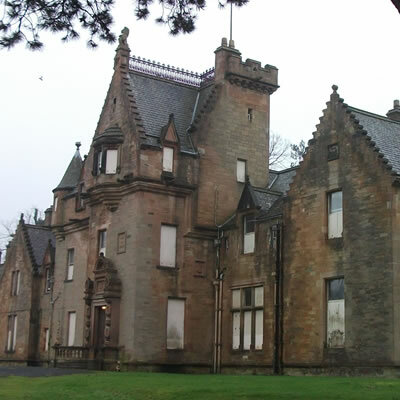 The history of Ormiston House was hidden to most residents of Northern Ireland, hidden behind green corrugated iron fences with a inner cordon of razor wire, it was clear that the public were not wanted. In fact, when this site took its photographs the NI Assembly appeared so concerned by our interest that they sent two of their top civil servants in very flash cars to facilitate access and gleam our reasons for wanting to view the property. Ormiston House hides many truths about Northern Ireland, our maritime history, it being the former home of both Edward J Harland founder of Harland & Wolff, builders of Titanic and home of Lord Pirri chairman of H&W and former Lord Mayor of Belfast but also crafted into the brick work a link to our Christian Foundations, verses and quotes most home owners would be proud of. The new owner has not yet declared any intention for the site, they could chose to renovate it as a home but as it was sold with planning permission they may seek to make a return on their investment by conducting limited development, only time will tell. What is telling about the Northern Ireland Assembly and the Northern Ireland Executive is their litany of on-going failings, for instead of capitalising on this building's potential for use within our tourist industry, they have squandered approximately �10 million of public money and received a pittance of just �1,505,355 following completion of the sale back in November 2015. Would you let these people in charge of your bank account - where they see such as loss as a good thing? For completeness we asked the Northern Ireland Assembly are there any conditions of sale binding the NI Assembly or NI Executive, financially or otherwise? We were told that all the terms of the contract are binding on the parties, which were the buyer and the Department of Finance and Personnel. So, despite the Northern Ireland Assembly failing to exempt itself from serving the information it holds it simply choose to side-step it. However, once Simply Belfast are in possession of this information we will bring it to you!